Three Genres gives students a basic introduction to fiction/ literary nonfiction, poetry, and drama and helps them to develop their creative skills in each area. Each genre section is self-contained and includes complete works as examples along with helpful advice about how to draw on the variety of techniques they use. The style is informal, practical, and positive. Minot encourages student to draw on their own experiences and develop skills on their own. NEW! 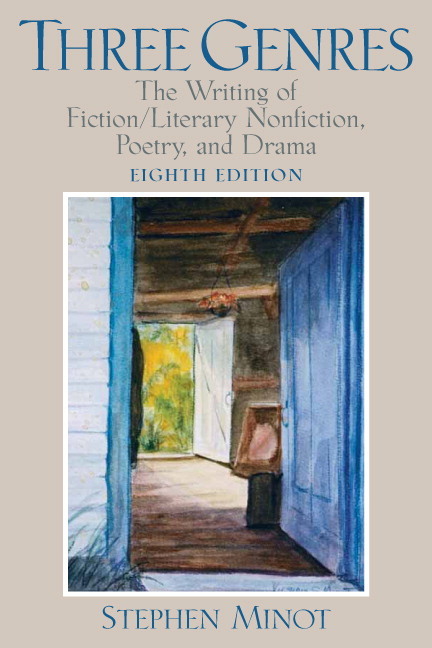 Literary nonfiction has been added as a separate but closely linked portion of the fiction section. This permits a close analysis of the contrasts between the personal essay and fiction, contrasts not addressed in any other text. NEW! A new chapter has been added: "Poems for Self-study." Twelve new poems not analyzed or discussed anywhere in the text to encourage self-study and classroom discussion. NEW! The Fiction/Literary Nonfiction section has been placed first (rather than poetry) to match the order in a majority of college and university courses. 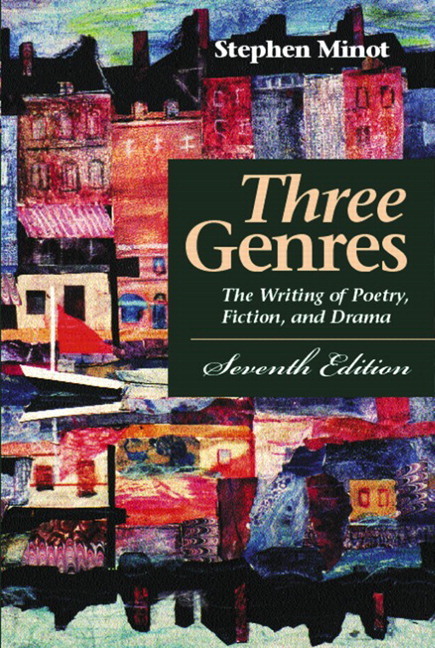 The analysis of writing techniques in each of the three genres (poetry, fiction, and drama)—Always linked directly with a work that appears in its entirety. Presents poems, short stories, and plays written by contemporary authors and poets analyzed from several perspectives. Ensures that students are never left with abstract principles that are not illustrated. Provides practical advice for submitting materials for publication. List of resources for writers. Provides a convenient starting place for students interested in more in-depth study. A chapter on Dialogue in Fiction. NEW! Fifteen new poems have been added for use as illustrations of specific poetic techniques. NEW! Two New Stories illustrating fictional techniques. Two new plays including the winner of a national search for new dramas. NEW! The "Trouble shooting" sections formerly placed in an appendix are now placed at the end of each of the three sections for handy use by students or by instructors in their critiques of student work. Instructors are encouraged to incorporate these when writing critiques of student work. This section considers topics (arranged alphabetically, with page references) that often give students trouble. Encourages students to evaluate the strengths and weaknesses of their own work when revising; provides a positive approach to the discussion of work in class; and, it offers instructors a convenient resource for augmenting their comments on student work, urging them to review specific topics such as thematic unity in poetry, irony in fiction, or dramatic impact in a play. NEW! The Headnotes at the beginning of each chapter have been redesigned and include page references for each topic listed. NEW! The Glossary/Index has been expanded making it the most complete of any text in the field. All literary terms used in the text are defined with pertinent page references given for further study. Insignificant page references (often found in computer-generated indexes) have been eliminated. 1. Literary nonfiction has been added as a separate but closely linked portion of the fiction section. This permits a close analysis of the contrasts between the personal essay and fiction, contrasts not addressed in any other text. 2. The Fiction/Literary Nonfiction section has been placed first (rather than poetry) to match the order in a majority of college and university courses. 3. A new chapter has been added: "Poems for Self-study." Twelve new poems not analyzed or discussed anywhere in the text to encourage self-study and classroom discussion. 4. Fifteen new poems have been added for use as illustrations of specific poetic techniques. 5. Two New Stories illustrating fictional techniques. 6. Two new plays including the winner of a national search for new dramas. 7. The "Trouble shooting" sections formerly placed in an appendix are now placed at the end of each of the three sections for handy use by students or by instructors in their critiques of student work. Instructors are encouraged to incorporate these when writing critiques of student work. 8. The Headnotes at the beginning of each chapter have been redesigned and include page references for each topic listed. 9.The Glossary/Index has been expanded making it the most complete of any text in the field. All literary terms used in the text are defined with pertinent page references given for further study. Insignificant page references (often found in computer-generated indexes) have been eliminated. 13. A Story by Jim Ray Daniels: "Minding the Store"
15. Setting: Where Am I? 16. A Story by Sharon Solwitz: "Obst Vw"
19. A Story by Steven Schutzman: "The Bank Robbery"
22. A Story by Jackson Jodie Daviss "Gotta Dance"
25. What Makes a Poem a Poem? 38. A Play by William Saroyan: "Hello Out There"
40. A Play by Tony Padilla: "Reckoning"
42. A Play by Glenn Alterman, "Coulda, Would, Shoulda"
46. A Play By Patricia Montley: "Valley Forgery"
Stephen Minot, Professor Emeritus of the Creative Writing Department at the University of California, Riverside, has taught creative writing for over thirty years. Over the span of his very successful career, Professor Minot authored three novels, two collections of short stories, and three textbooks including Reading Fiction and Literary Nonfiction, The Fourth Genre. His short stories have appeared in a variety of magazines and literary quarterlies including the Atlantic, Harpers, The Kenyon Review, The Virginia Quarterly Review, and the Sewanee Review, just to name a few. Professor Minot’s work has also been selected several times to appear in the O. Henry Prize Stories collection and The Best American Short Stories. He is also the recipient of the Atlantic First Award, the Saxton Memorial Fellowship, and the National Endowment for the Arts Fellowship for writing. Professor Minot and his wife, Virginia, split their time between California and Maine.